Airport Hannover-Langenhagen (HAJ). 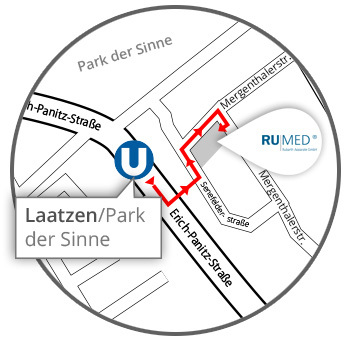 Take a taxi from there directly to RUMED or the S-Bahn S5 to Hannover Hbf (Central Railway Station) and after that the underground. Travel to the central railway station Hannover Hbf. From the railway station Hannover Hbf or Kröpke take the U1 direction Laatzen until the train stop Laatzen/Park der Sinne. In driving direction of the train walk on the left side of the road for about 50 m. After that, turn left into the dead-end street in direction housing area Otto-Hahn-Straße. At the end of the dead-end street turn left. After the right-hand bend in the road you will find RUMED on the right side of the road. Change from the A7 to the A37 and take the exit Messe Süd. After that, 1st traffic light left, again 1st traffic light left, 2nd traffic light left and take the 1st road right, the Mergenthalerstraße. Change to the A37 and take the exit Messe Süd. After that, 1st traffic light left, again 1st traffic light left and after that take the 1st road right, the Mergenthalerstraße.